Soak 10 quail eggs in cold water for about 10 minutes. This helps to prevent the eggs from breaking when you boil them later. In 2 cups of water, add the quail eggs and ½ tsp of sea salt. The salt also helps to prevent the eggs from breaking and give them a little flavor. Cook on high. Once it starts to boil, reduce the temperature to medium. If the temperature is too high, it will make the eggs break. Cook for 7 more minutes. Immediately after they finish boiling, drain the hot water and leave the eggs in cold water for several minutes. This helps make removing the shells easier. Prepare about 30 unsalted peanuts. Peel 1 tangerine or mandarin orange. Remove the white strings and divide them. Slightly peel off the cucumber skin. This way you can get some nice green color in your salad. Cut ⅔ cup of cucumber into ½-inch cubes. Cut ⅔ cup of strawberries in half. You can use about 8 cherry tomatoes instead of strawberries if you want. Cut 2 Korean crabsticks into ½-inch cubes. It should make about ½ cup. Cut ⅔ cup of Asian pears into ½-inch cubes. Like the cucumber, slightly peel off 1 apple. Use a sweet apple like Red Delicious. Cut 1 cup of apple into ½-inch cubes. In a large mixing bowl, add all of the ingredients and ½ cup of mayonnaise. Mix it gently. I only used mayonnaise for mine. If you want, you can add a little bit of salt or sugar depending on your taste in this step. How many people can this serve? The yield for this recipe is 1½ Quarts… and this is usually served as a appetizer or side..so if you consider that.. you can think how many people will eat this.. Thanks. How are you and your baby? 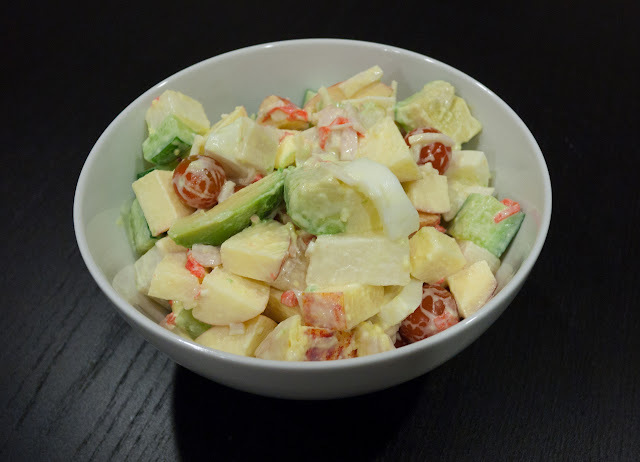 When I come across this recipe of yours it indeed reminded me of my younger days when I attended gatherings or christmas parties, someone will surely prepare this salad and it was very well received too. And this evening I made some and had them for supper. Yum! Thank you for sharing this recipe. Hi aeri! Can i asked what type of mayo did you used? I always go to Korean supermarket and saw one. Is that different with western mayo like craft? I never make salad before. It would be nice if i got the reply from you. I ate this salad yesterday at the restaurant and i want to make it for my self. Thanks! Thanks so much for this recipe~ It was delicious and I made lots of it for a potluck 🙂 although people seemed to like it as a dessert more than a side dish 😛 I’ll have to try some of your other recipes soon! I used your recipe (picture shown in “website” and it was delicious! I also added a little bit of avocado, making it more “california”! Hi Aeri! I think I’ll try to make this for our New Year’s Eve dinner tonight. Would love to try this one to make our holiday salad unique. I can already imagine how it tastes like! Yum! Happy New Year! Thank you for this recipe. I followed the style but with different ingredients. I put orange, shrimp, egg, raisin, potato, carrot, ham, corn, and sweet green beans. Is that still Korean style?! I have never boiled my own quail eggs before. I have bought the canned ones that are already boiled. I would like to try your method to boil them! Oh.. I’ve never tried canned ones either. How it tastes like ? very interesting.. Yep.. try to boil them at home.. maybe I guess it will be a little better than from can ?? hehe just guessing..
I’m so happy you added this!!! I’m going to the Korean market today! I’m going to pick up all my ingredients that I ran out of so that I can cook Korean again! do the quail eggs taste like chicken eggs? Well.. I think.. it’s almost same..but slightly different.. maybe.. quail eggs has a little (can’t taste much) bitter taste to me..
Just wanted to say that I (and my friends) love your blog and keep posting! My mom used to make it with raisins, apple, cucumber, boiled potato and egg, and I think blanched carrots and of course mayo. I’ve never eaten quail eggs before, though – must try it! Thanks for instructions on how to boil. Oh my god. You’re an angel! Thank you for this receipe….